I had another epiphany while jogging on a snow-covered path in Norwegian woods on an overcast day the week before the 1994 Winter Games opened. I fell once and nearly fell several times more because the flat light made it impossible to distinguish any bumps or contours on the essentially level path. My missteps happened at a speed of about 9 mph. How amazing it is, I thought, that skiers navigate in such light, with no shadow to help indicate terrain features, when they are descending at breakneck speeds on courses that change as a race goes on. The rut that wasn’t there during training runs. The bump they hadn’t seen before because a mistake knocked them slightly off a planned line. Elite ski races are decided by hundredths of a second. Some athletes achieve medal-winning margins because of superior technique, allowing them to take less risk – to a degree. Others shave those hundredths by skiing like the title of a terrific book on Alpine ski racing, “Right on the Edge of Crazy,” which means frequently on the brink of crashing. Which, in Lindsey Vonn’s case, meant frequently over the brink. That isn’t to say Vonn lacks good technique. No one could have gotten where she did without it. But what made her the world’s utterly dominant women’s downhill and Super-G racer for several seasons was her willingness to throw caution – and several of her body parts – to the wind. “It’s a bit like losing control of a car in the snow, in traffic,” NBC ski analyst Steve Porino said in a text message Monday. “99.9 percent of the people go immediately for the brake, which is the worst thing you can do, but it’s the normal reaction for survival. 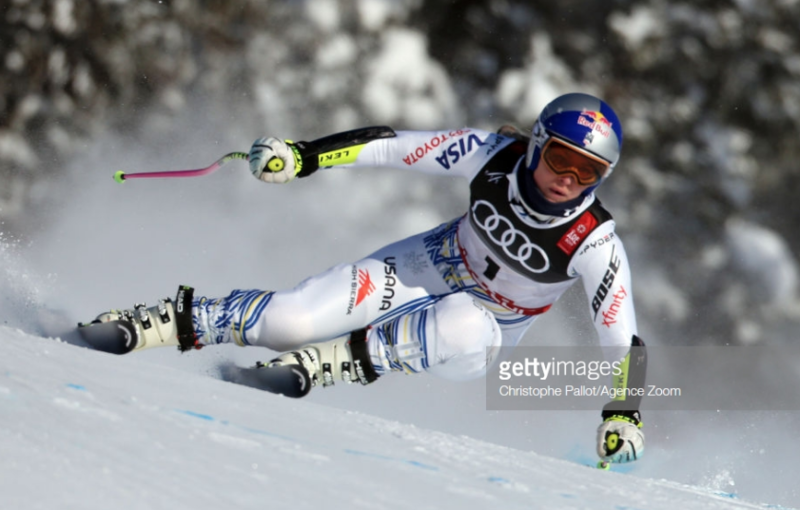 Vonn had missed much of 2013 and 2014 with knee injuries from crashes. A terrible training crash in November 2016 shattered her arm. She had insisted to me in an interview several months before the arm injury that she was managing risk better – not by taking a lot less risk overall, but backing off in certain weather and course conditions. She is ending at the World Alpine Championships in Are, Sweden, where Vonn planned to race Tuesday’s Super-G and Sunday’s downhill. The end is coming earlier than she hoped, because, as Vonn wrote Friday on her social media accounts, “My body is broken beyond repair and it isn’t letting me have the final season I dreamed of.” She revealed in those posts that there had been another knee surgery last spring and that a training crash last November had resulted in another knee ligament tear and fractures. Vonn is disappointed by having to leave competitive skiing just four wins short of the career World Cup record, 86, held by Sweden’s Ingemar Stenmark. Less than three years ago, it had seemed a near certainty that she would break that record, just as it now seems certain that countrywoman Mikaela Shiffrin will do it, given her 56 World Cup wins at just age 23. Yet there are no certainties in a sport where athletes race on slats down ice-injected courses at speeds that would get drivers a ticket on many of this country’s interstate highways. That Vonn was able to display her remarkable ability and nonpareil athletic courage and determination for this long was a gift – to her, to her sport, to anyone who appreciates athletic greatness. The result was 82 World Cup wins, 20 World Cup season titles, three Olympic medals and seven World Championship medals. There could have been so many more, but for the injuries. There may not have been as many, but for the will to overcome them. What she did still is enough to call her, with no doubt, the greatest women’s skier of all time and the greatest U.S. skier of all time. Porino is among those who feel Vonn is simply the best ever on the global level, no gender qualification needed. The veteran ski technician Heinz Hemmerle, who worked with Vonn Monday, told Porino “she would have easily won over 100 (World Cup) races” but for the 2013 crash in Schladming, Austria. Lindsey Vonn in Monday’s downhill training at the World Championships in Are, Sweden. Vonn’s romantic liaison with Tiger Woods later improved her standing among A-list celebrities. Although most of her compatriots know who she is, few paid any attention to what she does, no matter that, even as a multimillionaire athlete, she was still accessible to fans, still the kid who went from learning to ski on a molehill in Minnesota to the top of the world’s most perilous downhill courses, then to the bottom of them usually ahead of everyone else. I did my first story on Vonn in January 2005, when she was still Lindsey Kildow and suddenly had become a medal contender at that year’s World Championships. In that story, her first coach, Eric Sailer, and her father, Alan KIldow, already had identified the qualities that would make her an extraordinary skier in the speed events – and leave her in the safety netting so many times. "Lindsey can be a superstar because of her guts and fearlessness," Sailer said. Her father gave a variation of the same analogy Porino would use 14 years later. "It's like car racing," Alan Kildow said. "Some have the ability to hold their foot on the gas pedal longer than the others. She has that ability." By 2005, she already had endured a severe crash in a downhill at Lake Louise, Alberta, the World Cup tour spot that would come to be known as “Lake Lindsey” because of her relentless success there. From December 2004, when she won at Lake Louise for the first time, through December 2015, the last time she skied there in peak form, she won 14 of 22 downhills and four of 12 Super-Gs. When injury kept her out of the Lake Louise races this season, Vonn vowed to go back in December 2019 for a last hurrah. She won’t get there, despite yet another gut-busting attempt to put another patch on her tattered 34-year-old body. Hers was a generational talent combined with an even rarer competitive will. No one expects miracles from her at these World Championships. She has started just three races this season, all in mid-January, getting ninth and 15th in downhills and failing to finish a Super-G.
One can only hope this ends well, no matter how far from the podium she winds up. The problem is that it is hard to imagine Vonn taking these races as a mere victory lap, snowplowing down the hill to deserved applause. And that was exactly what happened in Tuesday’s Super-G. A mistake Vonn said was related to light conditions midway through the race sent her into a gate panel and then into the netting once again. She was able to get up and ski to the finish of a race Shiffrin won by .02, with the top four separated by just .07. Two-hundredths. Seven hundredths. Vonn said she expected to have a black eye and that “I rang my bell a little bit.” Whether she has lingering concussion issues could determine her status for Sunday’s downhill. What made her great also imperiled her, no matter that skiing at this level is perilous for everyone who does it. It is fast, so fast, so mind-bogglingly fast. And Lindsey Vonn pushed the limits, and she was faster than everyone else for so long.